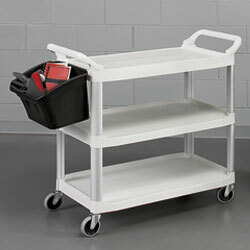 Transport a variety of items in commercial, retail, or manufacturing industries. Textured shelves resist scratches, chips, and dents. Other features include: comfort grip handles and non-marking swivel casters. Helps in assisting with HACCP compliance in the safe handling of food and related items. SPECIFY COLOR: BK - Black, GY - Gray, RD - Red, WH - Off-white. Colors are available as listed by code in chart. IN STOCK. HOOK-ON UTILITY BASKETS. Color: black. XC-1261 4 gal. cap. Wt. 5.4 lbs. 17"x12-1/8"x10-1/2"
XC-1262 8 gal. cap. Wt. 9 lbs. 17"x12"x22"